Kevin Johnson’s bizarre campaign to carry out a “coup” against the National Conference of Black Mayors, or NCBM, is looking more and more like his Waterloo. 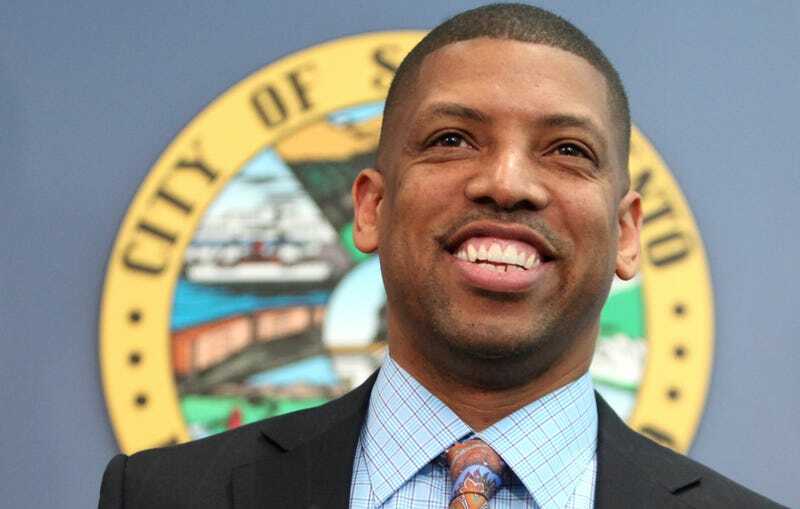 The former NBA All-Star and perpetually scandal-plagued Sacramento mayor, whose enthusiasms include charter schools and a variety of improprieties, launched a bid to take over the Atlanta-based NCBM in 2013. It was a disaster from the start: Johnson was bounced out of the organization’s presidency after just two weeks on the job, and has been in litigation ever since. Recently, the foray has finally begun to impact Johnson’s standing in his hometown, where he’s been in charge since 2008. It’s starting to hurt badly; in fact, fallout from the misguided affair has dominated the news cycle in Sacramento for a week. Deadspin’s reporting on the NCBM fiasco caused those who know Johnson best to start looking into it. The local ABC affiliate, KXTV-10, put a package on Johnson’s NCBM troubles (which included an interview with this reporter) atop an evening newscast earlier this week. Even the Sacramento Bee, the local daily with a reputation for having what one media critic in town described as a “soft spot for K.J.,” went long in rehashing the tale of Johnson’s NCBM foibles. Alas, correspondence from employees of the mayor’s office—using the very email accounts that Johnson and Ballard Spahr want to keep private—indicate Pittinsky was not telling the truth. Documents obtained by Deadspin from NCBM-related lawsuits show Johnson had initiated a search for a law firm to help engineer his coup of the organization months before the election. Again, this all took place before any election, and before the date Pittinsky cites as the one where Ballard Spahr was brought on. The “game plan” for the coup that Merchant and her Ballard Spahr team worked up with Johnson and his cronies entailed forming a “special task force” that would wield powers normally relegated to NCBM’s board of directors, and Johnson assigning Ballard Spahr duties that should rightly have been handled by the organization’s general counsel, Sue Winchester. Records indicate that the main task Johnson wanted these extra-organizational bodies to accomplish along the way to his complete power grab was the firing of NCBM executive director Vanessa Williams. Why does the timing matter here? Williams is now suing Kevin Johnson for defamation, and Ballard Spahr’s role as architects of Johnson’s campaign to depose Williams could open Pittinsky’s firm up to liability. More than that, it’s clear evidence of how Johnson, a big-city mayor with national ambitions, teamed up with a large law firm to plan a campaign involving an incredible amount of time, effort, and public money being spent bullying the administrator of a small non-profit—the sort of thing that could, and should, derail a political career. After Pittinsky spewed his falsehoods, host Ruyak attempted to ask Sosenko to comment on the impact of the “series of Deadspin articles” on Johnson’s NCBM foray. But Pittinsky interrupted the host and let loose with a tirade. Know anything we should know about Kevin Johnson? Email the reporter at dave.mckenna@deadspin.com, or use our SecureDrop system for extra security. Photo via AP.